And this is the one I made for Kate using different colours of foil cardstock. Difficult to photograph - sometimes the purple looks like pink, but very shiny and fun in real life! 2 awesome cards...2 lucky kids! Look at you being a good mom! I love that masculine one so much! Did he appreciate your execution, lol? I love the solid feel of the masculine card and adore the bright foil hearts on the second card. Those foil hearts are to die for and the absolutely perfect lining up of all those letters - stunning. I hope your kids save those cards. 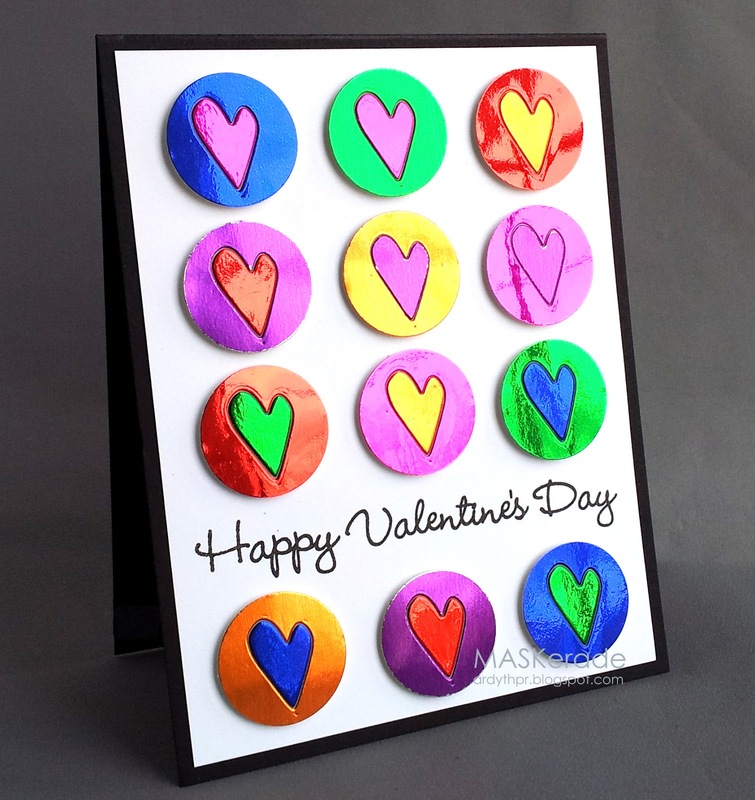 You know this is the first year I thought to give my kids a valentine?! I don't know what's wrong with me!! Never too late to start, they loved 'em, as I'm sure yours did. Such a fan of your b&w texty graphic card and the broken up word. These rock! Love the shiny red apostrophe and that foil paper is so cool! Two more AMAZING cards!!! Your kids (and their friends!) must think that you are THE coolest mom ever!!! 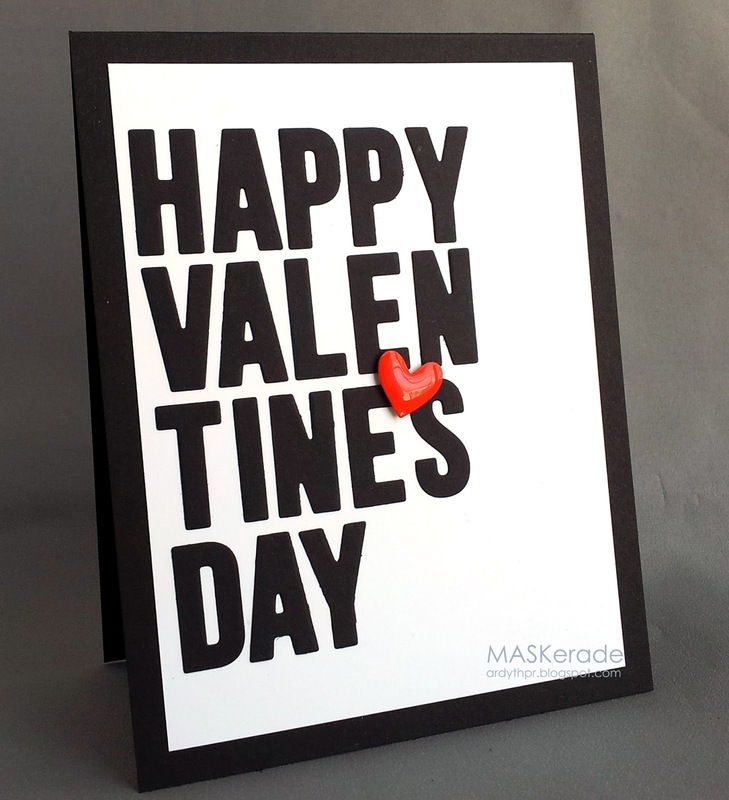 Bold B & W letters with just a wee schmick of 'love'....perfect young fella card! The foil paper on Kate's card is striking! Popping the sentiment between the rows of hearts - LOVE IT!!! Both so different, both so awesome. Both cards are great, but I really like the one for your son - stunning! Love both of these, Ardyth! I'm totally in love with BOTH of these cards! Just brilliant! Welol, you are sure ending Valentines season with a bang. These are all terrific--especially the one for your teen aged son. I love the way you use shine to highlight elements Ardyth! The heart looks fab and both cards are gorgeous!